Perfect for baseball lovers and fans of Mike Lupica, book three in the Triple Threat series by New York Times bestselling sports writer John Feinstein explores what happens when athletes break the rules. Alex Myers’s football and basketball seasons were mired in controversy, and his dad’s been MIA since his parents split up. All Alex wants this spring is to work on his fastball and hang out with his maybe-girlfriend, Christine. But he runs into unexpected competition on both fronts. Matt Gordon was suspended from sports after he admitted taking PEDs during football season, but the athletic board has decided to give him another chance. So he’s on the team—and he’s got something to prove. He’s also got his eye on Christine. The question this season—is all fair in love and baseball? Or are some things truly foul? 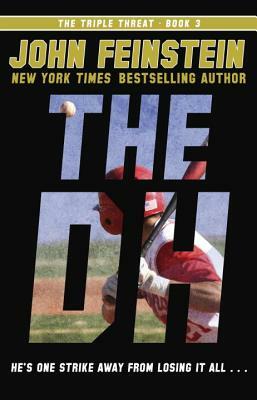 Filled with action, intrigue, and intense rivalries, The DH and the other books in the Triple Threat series follow the ups and downs of one talented athlete’s year in sports. John Feinstein is the author of many bestselling books, including A Season on the Brink and A Good Walk Spoiled. His books for young readers offer a winning combination of sports, action, and intrigue, with Last Shot receiving the Edgar Allan Poe Award for best young adult mystery of the year. He lives in Potomac, Maryland, and on Shelter Island, New York, with his family. Follow him on twitter @JFeinsteinBooks.